Self-cleaning fish tank that grows food. Fish waste feeds the plants. Plants clean the water. Sleek and attractive design with 3-gallon capacity. What is Aquaponics? Aquaponics is an ancient, sustainable method of farming developed by the Aztecs. It uses ninety percent less water than traditional farming methods and combines aquaculture (raising aquatic animals in tanks) and hydroponics (cultivating plants in water). The AquaFarm concentrates all the amazing features of large-scale aquaponics into a three gallon tank for your kitchen or classroom table. The fish poo and pee, and all that waste-water gets broken down by beneficial bacteria into nutrients. The waste-water from the fish is then pumped up and upcycled as an organic fertilizer for the plants. The plants take up the nutrients and, at the same time, clean the water which then falls back down for the fish. There is no soil - the plants are growing just on rocks - all the nutrients coming from the fish (no need for any artificial fertilizers - it's all organic!) 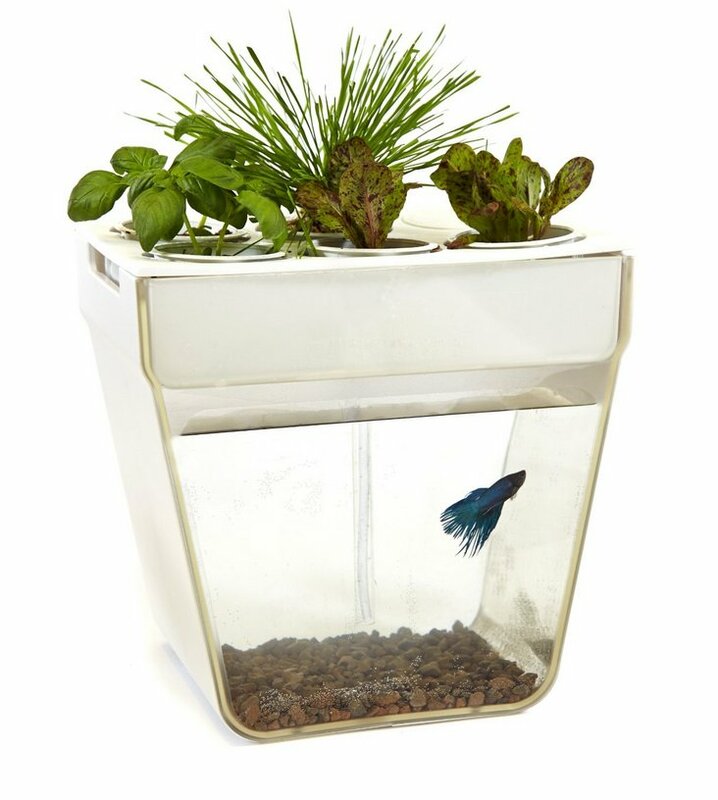 There is no need to change the water because of the plants - it's a self-cleaning fish tank!